Looking at the different types of kitchen countertops and their surfaces it can be hard to know which one will not only look good in your kitchen, but will give you the best performance. Bear in mind that the material you choose is going to be subjected to heat, cold, water, grease, and many other potentially damaging events over the course of its lifetime. When you start shopping and looking at the different types of countertops and their surfaces, you need to consider how you plan to use your kitchen. While everyone uses their kitchen to cook, it is more about what type of cooking you do and how often you cook. For example if you spend a lot of time cooking from scratch, you need counters that will stand up to heavy use and not require hours of cleaning. If you tend to cook quick meals due to a heavy work load, counters that may not need to stand up to heavy use but are extremely easy to keep clean make a better choice. In recent years there has been a major movement towards using granite. These countertops and their surfaces offer long lasting beauty as they are cut from slabs of natural rock. However they must be sealed on a regular basis since this type of rock is porous and will absorb moisture. This being said a good granite countertop will not scratch or scar providing you with a material that will look as good in ten years as it did the day your new kitchen countertops were first installed. As a low maintenance alternative you may want to consider quartz countertops. These are made from a blend of 97 percent quartz crystals and 3 percent fillers that when bonded together creates a countertop that looks like granite, is incredibly strong and smooth, and most importantly of all will never need to be sealed. ASA Builders Supply and Cabinet Corporation offer both countertop treatments in a variety of styles and temperaments. 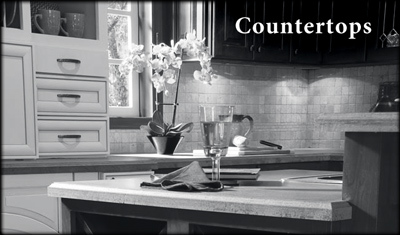 Do you think you could benefit from having new, durable countertops installed in your home? Call ASA Cabinets today at (248) 624-7400 and we will have you set up in no time.